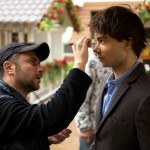 “We haven’t heard anything new from Alexander Rybak in a looong time — and for good reason. The Eurovision 2009 winner was busy with ‘MILKI‘ — his entry for Belarus’ Eurovision selection — and then found himself performing at the ESC pre-party in Riga, concerts, birthdays and so on. The man is in demand. But he’s finally BACK with fresh material. “Kotik” — that’s “Kitty” in English — is classic Alexander, replete with violin, love, an infectious beat and, um, beautiful girls. It’s a real earworm”. Read the Full Article Here – With Video and English translation of the lyrics.